Certification program creates a new resource for purchasers of building materials. Improving indoor air quality and reducing mold growth are quickly becoming top priorities for all types of commercial building projects. 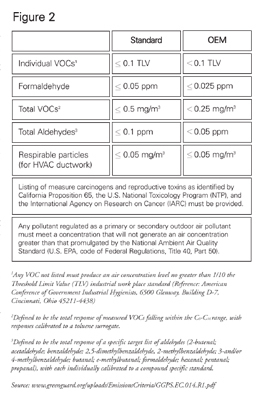 Many factors—including the presence of moisture and volatile organic compounds (VOCs)—can affect indoor air quality. Testing for microbial growth helps point to problems that can lead to product deterioration. One organization leading the way in testing, studies, and indoor air quality certification is the GREENGUARD Environmental Institute (GEI). This industry-independent, nonprofit organization oversees the GREENGUARD Certification Program, which helps improve indoor air quality products, environments, and buildings. The GREENGUARD Indoor Air Quality Certification Program for Low-Emitting Products uses independent, third-party testing to identify low-emitting products and materials. By voluntarily participating in the program, insulation manufacturers can address the growing green movement with products certified to meet end users’ needs. This and other valid certifications will become visible to architects, designers, product specifiers, and purchasing organizations, and these end users soon will be choosing products certified to meet certain indoor air quality and microbial resistance standards over those that are not. Certification is a win-win: It allows for testing that proves insulation materials are top-quality products, and it addresses the green initiatives currently at the forefront of the industry. Substantial mold growth on building materials can cause serious health issues for building occupants, and it has the potential to cause expensive damages to commercial buildings. By choosing moisture-resistant products, contractors and other end users can successfully manage these risks. At www.greenguard.org, GEI lists representative samples of products found to be microbial resistant when tested to the American Society for Testing and Materials (ASTM) standard. This is a new resource benefiting building owners, engineers, and facility managers who purchase building products. Building owners also may look into using these products to try to reduce their liability. The analytical approach used to determine microbial resistance was developed under a study of certain building materials conducted by Air Quality Sciences and piloted over 21 months. The test method was based on the U.S. Environmental Protection Agency’s (EPA’s) research guide, published as ASTM 6329-98 (2003), “Standard Guide for Developing Methodology for Evaluating the Ability of Indoor Materials to Support Microbial Growth Using Static Environmental Chambers.” A 9-month laboratory study was performed (Phase 1), followed by a year-long pilot study of products submitted for testing (Phase 2), to confirm and validate the type of mold, consistency of results from control samples, time course of mold growth, and different responses of the various materials tested. Ten manufacturers participated in the study. Products tested included insulation, adhesives, flooring, and wall covering. In Phase 1, researchers developed a baseline across newly manufactured products and established a ranking system. In Phase 2, the call was made to manufacturers; products were tested and then compared across types and constituency. Testing was designed to provide reliable, quantitative, and reproducible results across a wide range of building materials. 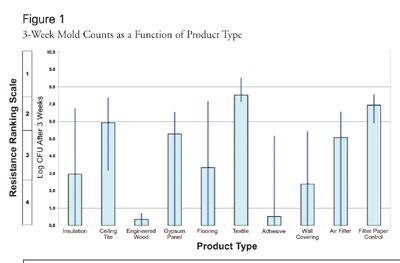 More information on the evaluative method used to identify microbial resistance in specific products is available at www.greenguard.org/uploads/TechDocs/GGTM.P040.R0.pdf. Once a product is tested and proven to resist mold growth under established environmental conditions, it is listed in the GREENGUARD Listing for Microbial Resistance at www.greenguard.org/Default.aspx?tabid=155. The products on this list were submitted voluntarily for testing by manufacturers who want to reduce their liability risks by confirming that their products are moisture and mold resistant. Once a product passes the test, GEI lists it for 1 year. After that, it must be re-tested to remain on the list. GEI receives an administrative fee for listing the products. The GREENGUARD Certification Program complies with established indoor air quality standards, such as the EPA’s purchasing requirements, the State of Washington’s Indoor Air Quality program, Germany’s Blue Angel program, and the U.S. Green Building Council’s (USGBC’s) Leadership in Energy and Environmental Design (LEED) program. Once a manufacturer’s products are certified, they can carry the GREENGUARD mark and are listed in the GREENGUARD Online Product Guide. These identifiers help end users identify and purchase certified, low-emitting products and materials. Insulation is just one of the materials tested in the certification process. GEI has developed standards for chemical and particle emissions, and it tests products to ensure that they meet those standards. These standards establish certification procedures (including test methods), allowable emissions levels, product sample collection and handling methods, testing type and frequency, and program application processes and acceptance. Figure 2 shows emission criteria for insulation in the GREENGUARD Certification Program. Other product categories tested are listed on the website. By testing materials for microbial growth, pollutants, and VOCs, the GREENGUARD program and others like it are carving out a path to a greener future. Helping companies provide high-quality products that improve moisture resistance and indoor air quality can lead to better health and safety, cleaner overall environments, and more reliable building materials. For more information on GREENGUARD, please call GEI at 800-427-9681 or visit www.greenguard.org.